Apiaceae or Umbelliferae is a family of mostly aromatic flowering plants named after the type genus Apium and commonly known as the celery, carrot or parsley family, or simply as umbellifers. It is the 16th-largest family of flowering plants, with more than 3,700 species in 434 genera including such well-known and economically important plants such as ajwain, angelica, anise, asafoetida, caraway, carrot, celery, chervil, coriander, cumin, dill, fennel, hemlock, lovage, cow parsley, parsley, parsnip and sea holly, as well as silphium, a plant whose identity is unclear and which may be extinct. Apiaceae: Apium leaves and tiny inflorescences, Daucus habit, Foeniculum inflorescences, Eryngium inflorescences, Petroselinum root. The family Apiaceae includes a significant number of phototoxic species and a smaller number of poisonous species. Some species in the family Apiaceae are cytotoxic. Most Apiaceae are annual, biennial or perennial herbs (frequently with the leaves aggregated toward the base), though a minority are woody shrubs or small trees such as Bupleurum fruticosum. :35 Their leaves are of variable size and alternately arranged, or with the upper leaves becoming nearly opposite. The leaves may be petiolate or sessile. There are no stipules but the petioles are frequently sheathing and the leaves may be perfoliate. The leaf blade is usually dissected, ternate or pinnatifid, but simple and entire in some genera, e.g. Bupleurum. Commonly, their leaves emit a marked smell when crushed, aromatic to foetid, but absent in some species. Apiaceae was first described by John Lindley in 1836. The name is derived from the type genus Apium, which was originally used by Pliny the Elder circa 50 AD for a celery-like plant. The alternative name for the family, Umbelliferae, derives from the inflorescence being generally in the form of a compound umbel. The family was one of the first to be recognized as a distinct group in Jacques Daleschamps' 1586 Historia generalis plantarum. With Robert Morison's 1672 Plantarum umbelliferarum distribution nova it became the first group of plants for which a systematic study was published. The family is solidly placed within the Apiales order in the APG III system. It is closely related to Araliaceae and the boundaries between these families remain unclear. Traditionally groups within the family have been delimited largely based on fruit morphology, and the results from this have not been congruent with the more recent molecular phylogenetic analyses. The subfamilial and tribal classification for the family is currently in a state of flux, with many of the groups being found to be grossly paraphyletic or polyphyletic. According to the Angiosperm Phylogeny Website as of July 2014[update], 434 genera are in the family Apiaceae. Umbel of Coriandrum sativum showing strong zygomorphy (asymmetry) in the outer flowers. The black swallowtail butterfly, Papilio polyxenes, uses the family Apiaceae for food and host plants for oviposition. The 22-spot ladybird is also commonly found eating mildew on these shrubs. Many members of this family are cultivated for various purposes. Parsnip (Pastinaca sativa), carrot (Daucus carota) and Hamburg parsley (Petroselinum crispum) produce tap roots that are large enough to be useful as food. Many species produce essential oils in their leaves or fruits and as a result are flavourful aromatic herbs. 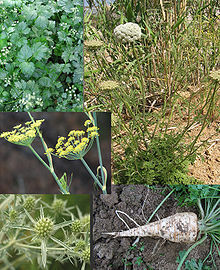 Examples are parsley (Petroselinum crispum), coriander (Coriandrum sativum), culantro, and dill (Anethum graveolens). The seeds may be used in cuisine, as with coriander (Coriandrum sativum), fennel (Foeniculum vulgare), cumin (Cuminum cyminum), and caraway (Carum carvi). Other notable cultivated Apiaceae include chervil (Anthriscus cerefolium), angelica (Angelica spp. ), celery (Apium graveolens), arracacha (Arracacia xanthorrhiza), sea holly (Eryngium spp. ), asafoetida (Ferula asafoetida), galbanum (Ferula gummosa), cicely (Myrrhis odorata), anise (Pimpinella anisum), lovage (Levisticum officinale), and hacquetia (Hacquetia epipactis). Generally, all members of this family are best cultivated in the cool-season garden; indeed, they may not grow at all if the soils are too warm. Almost every widely cultivated plant of this group is a considered useful as a companion plant. One reason is because the tiny flowers clustered into umbels, are well suited for ladybugs, parasitic wasps, and predatory flies, which actually drink nectar when not reproducing. They then prey upon insect pests on nearby plants. Some of the members of this family considered "herbs" produce scents that are believed to ...mask the odours of nearby plants, thus making them harder for insect pests to find. The poisonous members of the Apiaceae have been used for a variety of purposes globally. The poisonous Oenanthe crocata has been used to stupefy fish, Cicuta douglasii has been used as an aid in suicides, and arrow poisons have been made from various other family species. Daucus carota has been used as coloring for butter. Dorema ammoniacum, Ferula galbaniflua, and Ferula sumbul are sources of incense. The woody Azorella compacta Phil. has been used in South America for fuel. Many species in the family Apiaceae produce phototoxic substances (called furanocoumarins) that sensitize human skin to sunlight. Contact with plant parts that contain furanocoumarins, followed by exposure to sunlight, may cause phytophotodermatitis, a serious skin inflammation. Of all the plant species that have been reported to induce phytophotodermatitis, approximately half belong to the family Apiaceae. Phototoxic species include Ammi majus, the parsnip (Pastinaca sativa) and numerous species of the genus Heracleum, especially the giant hogweed (Heracleum mantegazzianum). The family Apiaceae also includes a smaller number of poisonous species, including poison hemlock, water hemlock, and fool's parsley. Some members of the family Apiaceae, including carrot, celery, fennel, parsley and parsnip, contain polyynes, an unusual class of organic compounds that exhibit cytotoxic effects. ^ a b c Stevens, P.F. (2001 onwards). Angiosperm Phylogeny Website. Version 9, June 2008. ^ Gorvett, Zaria. "The mystery of the lost Roman herb". Retrieved 4 June 2018. ^ a b Heywood, V.H. ; Brummitt, R.K.; Culham, A.; Seberg, O. (2007). Flowering plant families of the world. New York, U.S: Firefly books. ISBN 9781554072064. ^ a b Stace, C. A. (2010). New Flora of the British Isles (Third ed.). Cambridge, U.K.: Cambridge University Press. p. 88. ISBN 9780521707725. ^ a b Watson, L., Dallwitz, M.J. (1992 onwards) The families of flowering plants: descriptions, illustrations, identification, and information retrieval Archived 13 December 2010 at the Wayback Machine. Version: 4 March 2011. ^ Lindley, J. (1836) An Introduction to the Natural System of Botany, 2nd Edition. Longman, London. ^ Michael G. Simpson (20 July 2010). Plant Systematics. Academic Press. ISBN 978-0-12-374380-0. Retrieved 14 April 2012. ^ Woodville, W. (1793) Medical Botany. James Phillips, London. ^ "22-spot Ladybird Beetle (Psyllobora vigintiduopunctata)". iNaturalist.org. Retrieved 25 February 2019. ^ Leonard, Jayne (19 August 2017). "Phytophotodermatitis: When plants and light affect the skin". Medical News Today. Retrieved 8 August 2018. ^ Davis, Dawn (12 August 2011). "Sun-related Skin Condition Triggered by Chemicals in Certain Plants, Fruits". Dermatology, Mayo Clinic. Retrieved 8 August 2018. ^ Pathak, M. A.; Daniels Jr., Farrington; Fitzpatrick, T. B. (September 1962). "The Presently Known Distribution of Furocoumarins (Psoralens) in Plants". Journal of Investigative Dermatology. 39 (3): 225–239. doi:10.1038/jid.1962.106. Constance, L. (1971). "History of the classification of Umbelliferae (Apiaceae)." in Heywood, V. H. [ed. ], The biology and chemistry of the Umbelliferae, 1–11. Academic Press, London. Cronquist, A. (1968). The Evolution and Classification of Flowering Plants. Boston: Houghton Mifflin. "Don't touch these plants! Six lookalikes you want to avoid". Medium. U.S. Fish & Wildlife Service. 19 July 2017. Retrieved 11 August 2018. French, D. H. (1971). "Ethnobotany of the Umbelliferae." in Heywood, V. H. [ed. ], The biology and chemistry of the Umbelliferae, 385–412. Academic Press, London. Hegnauer, R. (1971) "Chemical Patterns and Relationships of Umbelliferae." in Heywood, V. H. [ed. ], The biology and chemistry of the Umbelliferae, 267–277. Academic Press, London. Heywood, V. H. (1971). "Systematic survey of Old World Umbelliferae." in Heywood, V. H. [ed. ], The biology and chemistry of the Umbelliferae, 31–41. Academic Press, London. Judd, W. S. et al. (1999). Plant Systematics: A Phylogenetic Approach. Sunderland, MA: Sinauer Associates, Inc.
Plunkett, G. M.; Downie, S. R. (1999). "Major lineages within Apiaceae subfamily Apioideae: a comparison of chloroplast restriction site and DNA sequence data". American Journal of Botany. 86: 1014–1026. doi:10.2307/2656619. Plunkett, G. M.; Soltis, D. E.; Soltis, P. S. (1996). "Higher Level Relationships of Apiales (Apiaceae and Araliaceae) Based on Phylogenetic Analysis of rbcL Sequences". Botanical Society of America. 83 (4): 499–515. doi:10.2307/2446219. Plunkett, G. M.; Soltis, D. E.; Soltis, P. S. (1996). "Evolutionary Patterns in Apiaceae: Inferences Based on matK Sequence Data". American Society of Plant Taxonomists. 21 (4): 477–495. doi:10.2307/2419610. Nieto Feliner, Gonzalo; Jury, Stephen Leonard & Herrero Nieto, Alberto (eds.) Flora iberica. Plantas vasculares de la Península Ibérica e Islas Baleares. Vol. X. "Araliaceae-Umbelliferae" (2003) Madrid: Real Jardín Botánico, CSIC (in Spanish). Scavo, Tom (11 August 2011). "Wild Parsnip and Friends in Vermont". Green Mountain Club. Retrieved 11 August 2018. Wikimedia Commons has media related to Apiaceae.